Accessible historic building. Photo: NPS files. Historically, most buildings and landscapes were not designed to be readily accessible for people with disabilities. In recent years, however, emphasis has been placed on preserving historically significant properties, and on making these properties-and the activities within them-more accessible to people with disabilities. With the passage of the Americans with Disabilities Act in 1990, access to properties open to the public is now a civil right. A significant entrance may be difficult to modify. Although a special challenge, sensitive changes can almost always be made to provide access while preserving the unique historic character. Photo: NPS files. This Preservation Brief introduces the complex issue of providing accessibility at historic properties, and underscores the need to balance accessibility and historic preservation. It provides guidance on making historic properties accessible while preserving their historic character; the Brief also provides examples to show that independent physical accessibility at historic properties can be achieved with careful planning, consultation, and sensitive design. While the Brief focuses primarily on making buildings and their sites accessible, it also includes a section on historic landscapes. The Brief will assist historic property owners, design professionals, and administrators in evaluating their historic properties so that the highest level of accessibility can be provided while minimizing changes to historic materials and features. Because many projects encompassing accessibility work are complex, it is advisable to consult with experts in the fields of historic preservation and accessibility before proceeding with permanent physical changes to historic properties. Modifications to historic properties to increase accessibility may be as simple as a small, inexpensive ramp to overcome one entrance step, or may involve changes to exterior and interior features. The Brief does not provide a detailed explanation of local or State accessibility laws as they vary from jurisdiction to jurisdiction. A concise explanation of several federal accessibility laws is included below. Historic properties are distinguished by features, materials, spaces, and spatial relationships that contribute to their historic character. Often these elements, such as steep terrain, monumental steps, narrow or heavy doors, decorative ornamental hardware, and narrow pathways and corridors, pose barriers to persons with disabilities, particularly to wheelchair users. Evaluate accessibility options within a preservation context. 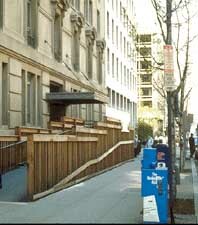 This accessibility ramp is compatible with the historic building in scale and materials. Photo: William Smith. If the property has been designated as historic (properties that are listed in, or eligible for listing in the National Register of Historic Places, or designated under State or local law), the property's nomination file should be reviewed to learn about its significance. Local preservation commissions and State Historic Preservation Offices can usually provide copies of the nomination file and are also resources for additional information and assistance. Review of the written documentation should always be supplemented with a physical investigation to identify which character defining features and spaces must be protected whenever any changes are anticipated. If the level of documentation for a property's significance is limited, it may be necessary to have a preservation professional identify specific historic features, materials, and spaces that should be protected. For most historic properties, the construction materials, the form and style of the property, the principal elevations, the major architectural or landscape features, and the principal public spaces constitute some of the elements that should be preserved. Every effort should be made to minimize damage to the materials and features that convey a property's historical significance when making modifications for accessibility. Very small or highly significant properties that have never been altered may be extremely difficult to modify. Secondary spaces and finishes and features that may be less important to the historic character should also be identified; these may generally be altered without jeopardizing the historical significance of a property. Nonsignificant spaces, secondary pathways, later additions, previously altered areas, utilitarian spaces, and service areas can usually be modified without threatening or destroying a property's historical significance. A building survey or assessment will provide a thorough evaluation of a property's accessibility. Most surveys identify accessibility barriers in the following areas: building and site entrances; surface textures, widths and slopes of walkways; parking; grade changes; size, weight and configuration of doorways; interior corridors and path of travel restrictions; elevators; and public toilets and amenities. Simple audits can be completed by property owners using readily available checklists (See Further Reading). Accessibility specialists can be hired to assess barriers in more complex properties, especially those with multiple buildings, steep terrain, or interpretive programs. Persons with disabilities can be particularly helpful in assessing specific barriers. All applicable accessibility requirements—local codes, State codes and federal laws—should be reviewed carefully before undertaking any accessibility modification. Since many States and localities have their own accessibility regulations and codes (each with their own requirements for dimensions and technical requirements), owners should use the most stringent accessibility requirements when implementing modifications. The Americans with Disability Act Accessibility Guidelines (ADAAG) is the document that should be consulted when complying with the Americans with Disabilities Act (ADA) requirements. Once a property's significant materials and features have been identified, and existing and required levels of accessibility have been established, solutions can be developed. Solutions should provide the greatest amount of accessibility without threatening or destroying those materials and features that make a property significant. Modifications may usually be phased over time as funds are available, and interim solutions can be considered until more permanent solutions are implemented. A team comprised of persons with disabilities, accessibility and historic preservation professionals, and building inspectors should be consulted as accessibility solutions are developed. Creating access to amenities and secondary spaces. The ramp's scale and materials are inconsistent with the historic character of the building. Photo: NPS files. All proposed changes should be evaluated for conformance with the Secretary of the Interior's "Standards for the Treatment of Historic Properties," which were created for property owners to guide preservation work. These Standards stress the importance of retaining and protecting the materials and features that convey a property's historical significance. Thus, when new features are incorporated for accessibility, historic materials and features should be retained whenever possible. Accessibility modifications should be in scale with the historic property, visually compatible, and, whenever possible, reversible. Reversible means that if the new feature were removed at a later date, the essential form and integrity of the property would be unimpaired. The design of new features should also be differentiated from the design of the historic property so that the evolution of the property is evident. In general, when historic properties are altered, they should be made as accessible as possible. However, if an owner or a project team believes that certain modifications would threaten or destroy the significance of the property, the State Historic Preservation Officer should be consulted to determine whether or not any special accessibility provisions may be used. Special accessibility provisions for historic properties will vary depending on the applicable accessibility requirements. In some cases, programmatic access may be the only option for extremely small or unaltered historic properties, such as a two-story house museum with no internal elevator. Programmatic access for historic properties refers to alternative methods of providing services, information, and experiences when physical access cannot be provided. It may mean offering an audio-visual program showing an inaccessible upper floor of a historic house museum, providing interpretive panels from a vista at an inaccessible terraced garden, or creating a tactile model of a historic monument for people with visual impairments. The goal in selecting appropriate solutions for specific historic properties is to provide a high level of accessibility without compromising significant features or the overall character of the property. The following sections describe accessibility solutions and offer guidance on specific historic property components, namely the building site, entrances, interiors, landscapes, amenities, and new additions. Several solutions are discussed in each section, referencing dimensions and technical requirements from the ADA's accessibility guidelines, ADAAG. State and local requirements, however, may differ from the ADA requirements. Before making any modification owners should be aware of all applicable accessibility requirements. An accessible route from a parking lot, sidewalk, and public street to the entrance of a historic building or facility is essential. An accessible route, to the maximum extent possible, should be the circulation route used by the general public. Critical elements of accessible routes are their widths, slopes, cross slopes, and surface texture. Each of these route elements must be appropriately designed so that the route can be used by everyone, including people with disabilities. The significant building site is now accessible to people with disabilities (note steps in front of ramp). Photo: NPS files. The distance between the arrival and destination points should also be as short as possible. Sites containing designed landscapes should be carefully evaluated before making accessibility modifications. Historic landscapes are described in greater detail below. If parking is provided, it should be as convenient as possible for people with disabilities. Specially designated parking can often be created to improve accessibility. Modifications to parking configurations and pathways should not alter significant landscape features. The route or path through a site to a historic building's entrance should be wide enough, generally at least 3 feet (91 cm), to accommodate visitors with disabilities and must be appropriately graded with a stable, firm, and slip-resistant surface. Existing paths should be modified to meet these requirements whenever possible as long as doing so would not threaten or destroy significant materials and features. Existing surfaces can often be stabilized by providing a new base and resetting the paving materials, or by modifying the path surface. In some situations it may be appropriate to create a new path through an inaccessible area. At large properties, it may be possible to regrade a slope to less than 1:20 (5%), or to introduce one or more carefully planned ramps. Clear directional signs should mark the path from arrival to destination. The historic threshold was made accessible with a 1/2" wood bevel. Photo: NPS files. Whenever possible, access to historic buildings should be through a primary public entrance. In historic buildings, if this cannot be achieved without permanent damage to character-defining features, at least one entrance used by the public should be made accessible. If the accessible entrance is not the primary public entrance, directional signs should direct visitors to the accessible entrance. A rear or service entrance should be avoided as the only mean of entering a building. Creating an accessible entrance usually involves overcoming a change in elevation. Steps, landings, doors, and thresholds, all part of the entrance, often pose barriers for persons with disabilities. To preserve the integrity of these features, a number of solutions are available to increase accessibility. Typical solutions include regrading, incorporating ramps, installing wheelchair lifts, creating new entrances, and modifying doors, hardware, and thresholds. In some cases, when the entrance steps and landscape features are not highly significant, it may be possible to regrade to provide a smooth entrance into a building. If the existing steps are historic masonry, they should be buried, whenever possible, and not removed. A new elevator entrance was provided next to the stairs to provide universal access to the services inside. Photo: Courtesy, GSA. Permanent ramps are perhaps the most common means to make an entrance accessible. As a new feature, ramps should be carefully designed and appropriately located to preserve a property's historic character. 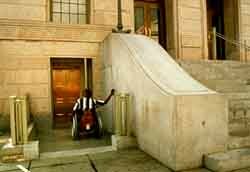 Ramps should be located at public entrances used by everyone whenever possible, preferably where there is minimal change in grade. Ramps should also be located to minimize the loss of historic features at the connection points-porch railings, steps, and windows-and should preserve the overall historic setting and character of the property. Larger buildings may have below grade areas that can accommodate a ramp down to an entrance. Below grade entrances can be considered if the ramp leads to a publicly used interior, such as an auditorium, or if the building is serviced by a public elevator. Ramps can often be incorporated behind historic features, such as cheek-walls or railings, to minimize the visual effect. The steepest allowable slope for a ramp is usually 1:12 (8%), but gentler slopes should be used whenever possible to accommodate people with limited strength. Greater changes in elevation require larger and longer ramps to meet accessibility scoping provisions and may require an intermediate landing. 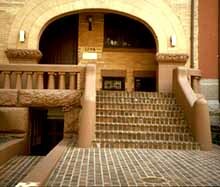 Most codes allow a slightly steeper ramp for historic buildings to overcome one step. Ramps can be faced with a variety of materials, including wood, brick, and stone. Often the type and quality of the materials determines how compatible a ramp design will be with a historic property. Unpainted pressure-treated wood should not be used to construct ramps because it usually appears temporary and is not visually compatible with most historic properties. Railings should be simple in design, distinguishable from other historic features, and should extend one foot beyond the sloped area. Ramp landings must be large enough for wheelchair users, usually at least 5 feet by 5 feet (152.5 cm by 152.5 cm), and the top landing must be at the level of the door threshold. It may be possible to reset steps by creating a ramp to accommodate minor level changes and to meet the threshold without significantly altering a property's historic character. If a building's existing landing is not wide or deep enough to accommodate a ramp, it may be necessary to modify the entry to create a wider landing. Long ramps, such as switchbacks, require intermediate landings, and all ramps should be detailed with an appropriate edge and railing for wheelchair users and visually impaired individuals. Temporary or portable ramps are usually constructed of light-weight materials and, thus, are rarely safe or visually compatible with historic properties. Moreover, portable ramps are often stored until needed and, therefore, do not meet accessibility requirements for independent access. Temporary and portable ramps, however, may be an acceptable interim solution to improve accessibility until a permanent solution can be implemented. Platform lifts and inclined stair lifts, both of which accommodate only one person, can be used to overcome changes of elevation ranging from three to 10 feet (.9 m-3 m) in height. However, many States have restrictions on the use of wheelchair lifts, so all applicable codes should be reviewed carefully before installing one. Inclined stair lifts, which carry a wheelchair on a platform up a flight of stairs, may be employed selectively. They tend to be visually intrusive, although they are relatively reversible. Platform lifts can be used when there is inadequate space for a ramp. However, such lifts should be installed in unobtrusive locations and under cover to minimize maintenance if at all possible. A similar, but more expensive platform lift has a retracting railing that lowers into the ground, minimizing the visual effect to historic properties. Mechanical lifts have drawbacks at historic properties with high public visitation because their capacity is limited, they sometimes cannot be operated independently, and they require frequent maintenance. When it is not possible to modify an existing entrance, it may be possible to develop a new entrance by creating an entirely new opening in an appropriate location, or by using a secondary window for an opening. This solution should only be considered after exhausting all possibilities for modifying existing entrances. 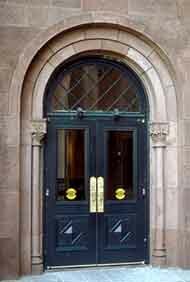 Historic doors generally should not be replaced, nor should door frames on the primary elevation be widened, as this may alter an important feature of a historic design. However, if a building's historic doors have been removed, there may be greater latitude in designing a compatible new entrance. Most accessibility standards require at least a 32" (82 cm) clear opening with manageable door opening pressures. The most desirable preservation solution to improve accessibility is retaining historic doors and upgrading the door pressure with one of several devices. Automatic door openers (operated by push buttons, mats, or electronic eyes) and power-assisted door openers can eliminate or reduce door pressures that are accessibility barriers, and make single or double-leaf doors fully operational. This door handle has been retrofitted to meet ADA requirements. Photo: NPS files. If a door opening is within an inch or two of meeting the 32" (81 cm) clear opening requirement, it may be possible to replace the standard hinges with off-set hinges to increase the size of the door opening as much as 1 Ω" (3.8 cm). Historic hardware can be retained in place, or adapted with the addition of an automatic opener, of which there are several types. 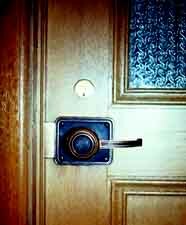 Door hardware can also be retrofitted to reduce door pressures. For example, friction hinges can be retrofitted with ball-bearing inserts, and door closers can be rethreaded to reduce the door pressure. A door threshold that exceeds the allowable height, generally 1/2" (1.3 cm), can be altered or removed with one that meets applicable accessibility requirements. If the threshold is deemed to be significant, a bevel can be added on each side to reduce its height. Another solution is to replace the threshold with one that meets applicable accessibility requirements and is visually compatible with the historic entrance. Many accessibility solutions can be implemented easily and inexpensively without destroying the significance of historic properties. While it may not be possible to undertake all of the modifications listed below, each change will improve accessibility. Creating a designated parking space. Rearranging tables, displays, and furniture. Installing or adding accessible door hardware. Adding an accessible water fountain, or providing a paper cup dispenser at an inaccessible water fountain. Installing a higher toilet seat. Repositioning the paper towel dispenser. A retractable lift for this historic building foyer was created using "like" materials. Photo: NPS files. Persons with disabilities should have independent access to all public areas and facilities inside historic buildings. The extent to which a historic interior can be modified depends on the significance of its materials, plan, spaces, features, and finishes. Primary spaces are often more difficult to modify without changing their character. Secondary spaces may generally be changed without compromising a building's historic character. Signs should clearly mark the route to accessible restrooms, telephones, and other accessible areas. If space permits, ramps and wheelchair lifts can also be used to increase accessibility inside buildings. However, some States and localities restrict interior uses of wheelchair lifts for life-safety reasons. Care should be taken to install these new features where they can be readily accessed. Ramps and wheelchair lifts are described below. Elevators are an efficient means of providing accessibility between floors. Some buildings have existing historic elevators that are not adequately accessible for persons with disabilities because of their size, location, or detailing, but they may also contribute to the historical significance of a building. Significant historic elevators can usually be upgraded to improve accessibility. Control panels can be modified with a "wand" on a cord to make the control panel accessible, and timing devices can usually be adjusted. Historic door knobs and other hardware may be difficult to grip and turn. In recent years, lever-handles have been developed to replace door knobs. Other lever-handle devices can be added to existing hardware. If it is not possible or appropriate to retrofit existing door knobs, doors can be left open during operating hours (unless doing so would violate life safety codes), and power-assisted door openers can be installed. It may only be necessary to retrofit specific doorknobs to create an accessible path of travel and accessible restrooms. Stairs are the primary barriers for many people with disabilities. However, there are some ways to modify stairs to assist people who are able to navigate them. It may be appropriate to add hand railings if none exist. Railings should be 1 º" (3.8 cm) in diameter and return to the wall so straps and bags do not catch. Color-contrasting, slip-resistant strips will help people with visual impairments. Finally, beveled or closed risers are recommended unless the stairs are highly significant, because open risers catch feet. Some amenities in historic buildings, such as restrooms, seating, telephones, drinking fountains, counters, may contribute to a building's historic character. They will often require modification to improve their use by persons with disabilities. In many cases, supplementing existing amenities, rather than changing or removing them, will increase access and minimize changes to historic features and materials. Restrooms may have historic fixtures such as sinks, urinals, or marble partitions that can be retained in the process of making modifications. For example, larger restrooms can sometimes be reconfigured by relocating or combining partitions to create an accessible toilet stall. Other changes to consider are adding grab bars around toilets, covering hot water pipes under sinks with insulation to prevent burns, and providing a sink, mirror, and paper dispenser at a height suitable for wheelchair users. A unisex restroom may be created if it is technically infeasible to create two fully accessible restrooms, or if doing so would threaten or destroy the significance of the building. It is important to remember that restroom fixtures, such as sinks, urinals, and partitions, may be historic, and therefore, should be preserved whenever possible. Other amenities inside historic buildings may require modification. Seating in a theater, for example, can be made accessible by removing some seats in several areas. New seating that is accessible can also be added at the end of existing rows, either with or without a level floor surface. Readily removable seats may be installed in wheelchair spaces when the spaces are not required to accommodate wheelchair users. Historic water fountains can be retained and new, two-tiered fountains installed if space permits. If public telephones are provided, it may be necessary to install at least a Text Telephone (TT), also known as a Telecommunication Device for the Deaf (TDD. Historic service counters commonly found in banks, theaters, and hotels generally should not be altered. It is preferable to add an accessible counter on the end of a historic counter if feasible. Modified or new counters should not exceed 36" (91.5 cm) in height. Many new additions are constructed specifically to incorporate modern amenities such as elevators, restrooms, fire stairs, and new mechanical equipment. These new additions often create opportunities to incorporate access for people with disabilities. It may be possible, for example, to create an accessible entrance, path to public levels via a ramp, lift, or elevator. However, a new addition has the potential to change a historic property's appearance and destroy significant building and landscape features. Thus, all new additions should be compatible with the size, scale, and proportions of historic features and materials that characterize a property. New additions should be carefully located to minimize connection points with the historic building, such that if the addition were to be removed in the future, the essential form and integrity of the building would remain intact. On the other hand, new additions should also be conveniently located near parking that is connected to an accessible route for people with disabilities. As new additions are incorporated, care should be taken to protect significant landscape features and archeological resources. Finally, the design for any new addition should be differentiated from the historic design so that the property's evolution over time is clear. New additions frequently make it possible to increase accessibility, while simultaneously reducing the level of change to historic features, materials, and spaces. To successfully incorporate access into historic landscapes, the planning process is similar to that of other historic properties. Careful research and inventory should be undertaken to determine which materials and features convey the landscape's historical significance. As part of this evaluation, those features that are character-defining (topographical variation, vegetation, circulation, structures, furnishings, objects) should be identified. Historic finishes, details, and materials that also contribute to a landscape's significance should also be documented and evaluated prior to determining an approach to landscape accessibility. For example, aspects of the pedestrian circulation system that need to be understood include walk width, aggregate size, pavement pattern, texture, relief, and joint details. The context of the walk should be understood including its edges and surrounding area. Modifications to surface textures or widths of pathways can often be made with minimal effect on significant landscape features. Additionally, areas of secondary importance such as altered paths should be identified-especially those where the accessibility modifications will not destroy a landscape's significance. By identifying those features that are contributing or non-contributing, a sympathetic circulation experience can then be developed. After assessing a landscape's integrity, accessibility solutions can be considered. Full access throughout a historic landscape may not always be possible. Generally, it is easier to provide accessibility to larger, more open sites where there is a greater variety of public experiences. However, when a landscape is uniformly steep, it may only be possible to make discrete portions of a historic landscape accessible, and viewers may only be able to experience the landscape from selected vantage points along a prescribed pedestrian or vehicular access route. When defining such a route, the interpretive value of the user experience should be considered; in other words, does the route provide physical or visual access to those areas that are critical to understand the meaning of the landscape? The automatic door to this museum building is a practical solution for universal entry. Photo: NPS files. The Architectural Barriers Act stipulates that all buildings designed, constructed, and altered by the Federal Government, or with federal assistance, must be accessible. Changes made to federal buildings must meet the Uniform Federal Accessibility Standards (UFAS). Special provisions are included in UFAS for historic buildings that would be threatened or destroyed by meeting full accessibility requirements. The Rehabilitation Act requires recipients of federal financial assistance to make their programs and activities accessible to everyone. Recipients are allowed to make their properties accessible by altering their building, by moving programs and activities to accessible spaces, or by making other accommodations. Historic properties are not exempt from the Americans with Disabilities Act (ADA) requirements. To the greatest extent possible, historic buildings must be as accessible as non-historic buildings. However, it may not be possible for some historic properties to meet the general accessibility requirements. Under Title II of the ADA, State and local governments must remove accessibility barriers either by shifting services and programs to accessible buildings, or by making alterations to existing buildings. For instance, a licensing office may be moved from a second floor to an accessible first floor space, or if this is not feasible, a mail service might be provided. However, State and local government facilities that have historic preservation as their main purpose-State-owned historic museums, historic State capitols that offer tours-must give priority to physical accessibility. Under Title III of the ADA, owners of "public accommodations" (theaters, restaurants, retail shops, private museums) must make "readily achievable" changes; that is, changes that can be easily accomplished without much expense. This might mean installing a ramp, creating accessible parking, adding grab bars in bathrooms, or modifying door hardware. The requirement to remove barriers when it is "readily achievable" is an ongoing responsibility. When alterations, including restoration and rehabilitation work, are made, specific accessibility requirements are triggered. Recognizing the national interest in preserving historic properties, Congress established alternative requirements for properties that cannot be made accessible without "threatening or destroying" their significance. A consultation process is outlined in the ADA's Accessibility Guidelines for owners of historic properties who believe that making specific accessibility modifications would "threaten or destroy" the significance of their property. In these situations, after consulting with persons with disabilities and disability organizations, building owners should contact the State Historic Preservation Officer (SHPO) to determine if the special accessibility provisions for historic properties may be used. Further, if it is determined in consultation with the SHPO that compliance with the minimum requirements would also 'threaten or destroy" the significance of the property, alternative methods of access, such as home delivery and audio-visual programs, may be used. Historic properties are irreplaceable and require special care to ensure their preservation for future generations. With the passage of the Americans with Disabilities Act, access to historic properties open to the public is a now civil right, and owners of historic properties must evaluate existing buildings and determine how they can be made more accessible. It is a challenge to evaluate properties thoroughly, to identify the applicable accessibility requirements, to explore alternatives and to implement solutions that provide independent access and are consistent with accepted historic preservation standards. Solutions for accessibility should not destroy a property's significant materials, features and spaces, but should increase accessibility as much as possible. Most historic buildings are not exempt from providing accessibility, and with careful planning, historic properties can be made more accessible, so that all citizens can enjoy our Nation's diverse heritage. Thomas C. Jester is an Architectural Historian with the Preservation Assistance Division of the National Park Service. Sharon C. Park, AIA, is the Senior Historical Architect with the Preservation Assistance Division, National Park Service. The authors wish to thank Charles A. Birnbaum, ASLA, Historical Landscape Architect with the Preservation Assistance Division, National Park Service, for contributing the section on historic landscapes. The authors gratefully acknowledge the invaluable comments made by the following individuals who reviewed the draft manuscript: William Smith, Massachusetts Historical Commission; Kay Weeks, H. Ward Jandl, Michael Auer, and Charles A. Birnbaum, Preservation Assistance Division, National Park Service; Clare Adams, New York Department of Parks, Recreation and Historic Preservation; Lauren Bowlin, Maryland Historical Trust; Tom Mayes, National Trust for Historic Preservation; Elizabeth Igleheart, Maine Historic Preservation Commission; Milford Wayne Donaldson, FAIA; Paul Beatty, U.S. Architectural and Transportation Barriers Compliance Board; Mid-Atlantic Regional Office, National Park Service; Western Regional Office, National Park Service. 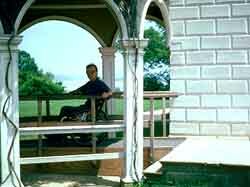 Ballantyne, Duncan S. and Harold Russell Associates, Inc. Accommodation of Disabled Visitors at Historic Sites in the National Park System. Washington, D.C.: Park Historic Architecture Division, National Park Service, U.S. Department of the Interior, 1983. Goldman, Nancy. Ed. Readily Achievable Checklist: A Survey for Accessibility. 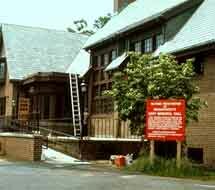 Boston: Adaptive Environments Center, 1993. Hayward, Judith L. and Thomas C. Jester, compilers. Accessibility and Historic Preservation Resource Guide. Windsor, Vermont: Historic Windsor, Inc., 1992, revised 1993. Jester, Thomas C. Preserving the Past and Making it Accessible for People with Disabilities. Washington, D.C.: Preservation Assistance Division, National Park Service, U.S. Department of the Interior, 1992. Parrott, Charles. 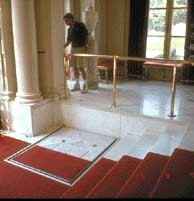 Access to Historic Buildings for the Disabled. Washington, D.C.: U.S. Department of the Interior, 1980. Secretary of the Interior's Standards for the Treatment of Historic Properties. Washington, D.C.: Preservation Assistance Division, National Park Service, U.S. Department of the Interior, 1993. Smith, William D. and Tara Goodwin Frier. Access to History: A Guide to Providing Access to Historic Buildings for People with Disabilities. Boston: Massachusetts Historical Commission, 1989. Standards for Accessible Design: ADA Accessibility Guidelines (ADAAG). Washington, D.C.: U.S. Department of Justice, 1991.